Just when the impression in my head about French Listenable Records was settled for them being a modern death/thrash (and sometimes black) promoting outfit, the label releases a quality gothic metal record reviving the lives of a Portuguese trio Heavenwood. “Modestly” titled Abyss Masterpiece presents an exercise in well executed and pleasant to listen to, if not too adventurous, gothic metal. With the help of the session drummer the trio of Ernesto Guerra, Ricardo Dias and Bruno Silva are very much intent on showing that Moonspell is not the only name in town when it gets to Portuguese gothic metal. One could not help but to detect some similarities, however, with Heavenwood more notable countrymen. Just like Moonspell Heavenwood is apt at harsh steady riffing with decidedly metallic, but nowhere near as industrialized, sound. The proof is in the orchestrally arranged dark compositions as the opener The Arcadia Order and Goddess Presiding Over Solitude. Prominent and well-placed guitar leads further distinguish Heavenwood, however they also at times experiment with muting the melody and focus on percussion aspect of the music (Morning Glory Clouds). Heavewood span the whole gamut of dark/gothic metal, slipping into heavy slumbering dream a la Evergrey on Once a Burden and going partially (Fading Sun) or decidedly (Sudden Scars) mid-Eastern in their melody and arrangements bringing comparisons with Therion. 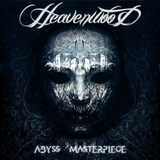 Abyss Masterpiece song construction is mostly simplified, but there is something to be said about quality heavy riffs and supercatchy melodies, a definite positive trait of Heavenwood. I guarantee you will be humming those gliding melodies from Leonor and A Poem for Matilde long after these songs are over. At times, the desire to be overly catchy puts the band on a slippery slope to soft rock compositions, which no amount of distorted guitar fuzz and vocal gruffness can hide (September Blood and, especially, Like Yesterday). Speaking of vocals, this is another strong suite for Heavenwood. Apparently, two team members contribute their chords to the proceedings, which results in the variety of male voices on the album, from Moonspell firebreathing (The Arcadia Order) to harsher than latter day Nick Holmes of Paradise Lost (Morning Glory Clouds) to effective duets of the clean and harsh male singing (Once a Burden). The very measured presence of female vocals, the femme fatale duet on Leonor and angelic chorus on Morning Glory Clouds, does nothing to dumb down or dilute the heaviness of the album, and certainly does not place Abyss Masterpiece in some of those sweeter than saccharine gothic metal categories. Aside from a few track missteps (personal opinion, of course) which I tended to skip on repeated listens, Abyss Masterpiece presents a side of gothic metal which is more acceptable to this reviewer. Simple songs and all, the focus here is more on quality musicianship, melodies and darker atmosphere than on a lead singer in scantily clad clothes. The lyrical subject matter based on the writings of a Portuguese poet Marquesa de Alorna is also an interesting twist. Think somewhere between more gothic Moonspell and mid-era Beseech and check Abyss Masterpiece out.